Whitney Coffee Company now sells Baratza coffee Grinders. 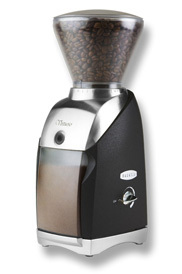 Your coffee grinder is the most important piece of equipment in your coffee making equation. An inexpensive French press will yield a remarkable cup of coffee but the same does not hold true for an inexpensive grinder. When brewing coffee you goal is to get an even extraction from all your ground coffee but that cannot occur with a poor quality grinder; On a microscopic level think of your coffee grounds as being dust, proper sized and boulders all in a 1/3 ratios for arguments sake. The dust gets over extracted and the boulder size pieces are under-extracted. The net affect may be a coffee that is acceptable, in terms of strength, because the dust and boulder sized particles have averaged out so to speak. However, your over-extracted dust particles have the nasty side affect of adding bitterness to your cup. A proper coffee grinder will yield a noticeably better cup of coffee and Baratza coffee grinders are the only home grinders we recommend. Quality burrs, proper burr mounting and cool grinding is what sets the Baratza apart from the rest. These grinders will give you very consistent particle size and their slow high torque motors will not overheat the coffee. We use a Baratza Virtuoso as our decaf espresso grinder and it does a very good job.